John Douaglin has been appointed the head coach of the Democratic Republic of Congo, the country's Basketball Federation confirmed on Wednesday. 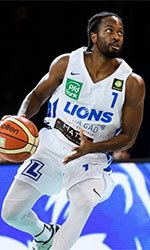 Douaglin replaces Papy Kipunka Kiembe, who helped the Congolese qualify for the FIBA AfroBasket 2017 - their first appearance in FIBA Africa's premier competition in a decade - and led the team in the first window of the FIBA Basketball World Cup 2019 African Qualifiers last November. Frenchman Douaglin is known in African basketball circles as he served as the assistant coach to Cote d'Ivoire at FIBA AfroBasket 2009, where the "Elephants" finished in the second-place, and as a result, qualified for the FIBA Basketball World Cup 2010 in Turkey. Douaglin's appointment, the DR Congo Basketball Federation said to FIBA.basketball, comes in a bid to help them qualify for next year's FIBA Basketball World Cup in China. "DR Congo has been absent from the international stage for more than 10 years. Now that we are back, we need experienced people who could help us move forward," noted Joe Lolonga, the General Manager of DR Congo Basketball Federation. He continued: "Our main target is to win all three games in the June-July window, and I am confident that Douaglin can help us accomplish this mission for the happiness of the Congolese people." Drawn in Group C of the African Qualifiers - along Angola, Egypt, and Morocco - DR Congo opened their Group Phase campaign with three defeats in as many games. Their Group C's second-leg in June-July in Egypt emerges as a do-or-die situation as only the teams that finish in the top-three places of each group advance to the 12-team Second Round. Yet, Lolonga insists they can turn things around. "To achieve our goals, we have appointed Carlo Viera, former team manager of Cote d'Ivoire as Sports Director. He has a great experience of international basketball as he helped Cote d'Ivoire qualify for the FIBA Basketball World Cup 2010."